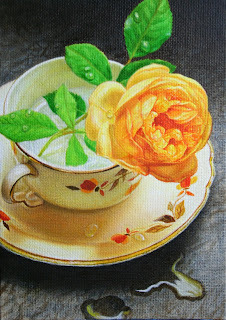 Hall's Jewel Tea "Teacup & Yellow Rose" Still Life Oil Painting 5"x7" canvas panel. A work in progress no longer..... DONE! Not for sale at present. Rose just beginning to "breathe." 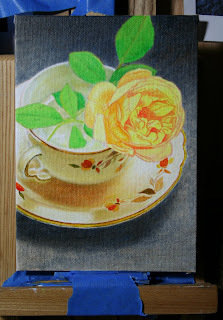 Now the detail work will continue on the background / saucer / cup / rose / tones, values & hues adjusted. Still establishing shadows & color blocking in preparation for detailed work ahead. 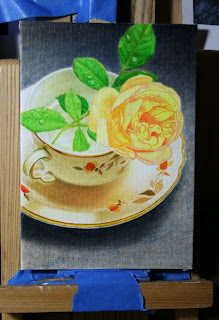 As this little painting nears completion, I am anxiously looking forward to bringing the rose to life. There's lots more to be done! I paint directly over my sketch.... the real fun begins now. Third Session: After third turp/wash (this time Burnt Umber) I wipe the canvas very lightly with a kimwipe to remove just a little paint from the highest points of the cloth. Then I lightly apply payne's gray straight from the tube to establish the shadows. 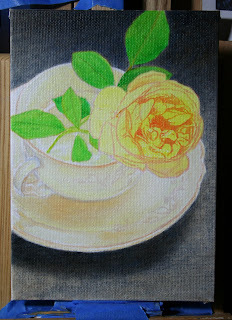 The background is ready for detail but after drying.... so now I move on to the teacup & saucer / rose. 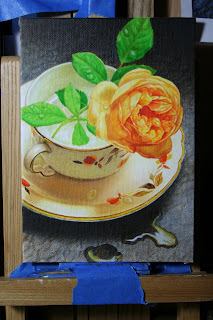 Second Session: Closeup of the actual porcelain tile of the countertop in my reference image for this painting. 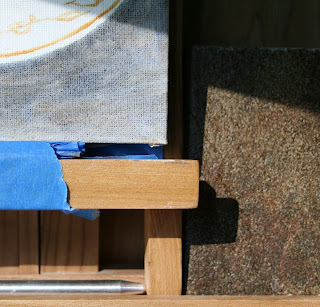 See how using turpentine washes in layers (letting each completely dry before applying another) utilizes the canvas to develop a stipple pattern needed to duplicate the tile. Here I have only added two washes thus far (payne's gray + burnt umber) and will continue until satisfied w/results. This charming deep yellow flower is "Graham Thomas" English Rose. The teacup & saucer are in an antique china pattern called "Autumn Leaf" by Hall. 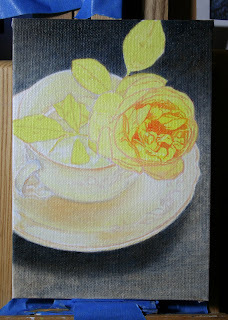 First Session: I did a quick placement (I call a dot'n dash) then using these reference points sketched the flower, cup & saucer followed by color blocking an underpainting. 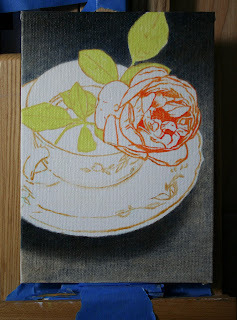 A quick turp wash of the background and this little painting begins. 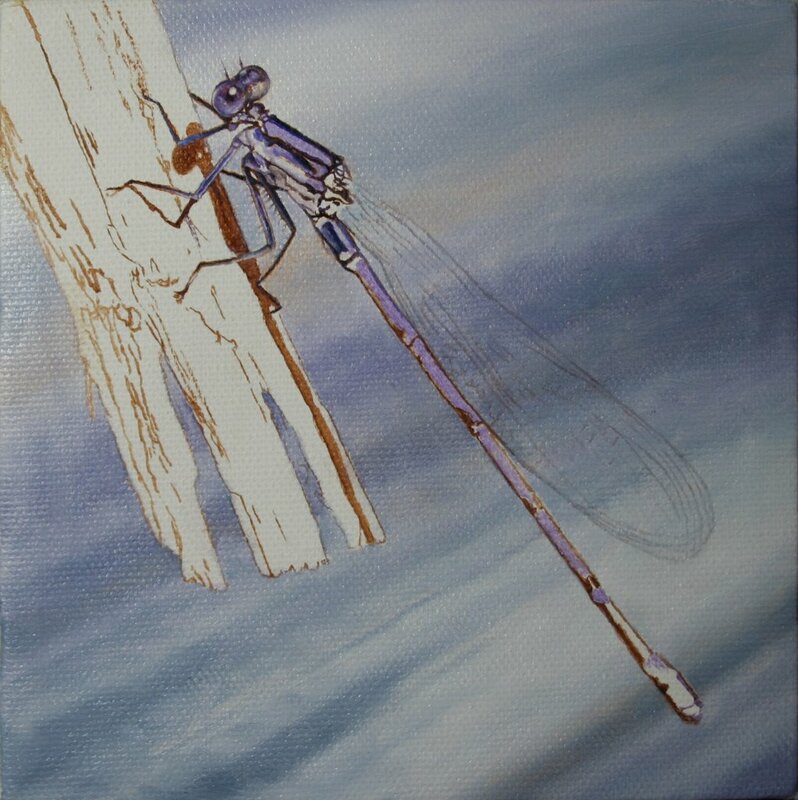 In the next painting session I will complete the background before proceeding on the subjects. When I'm not painting I am stocking up on reference photos for future nature paintings. 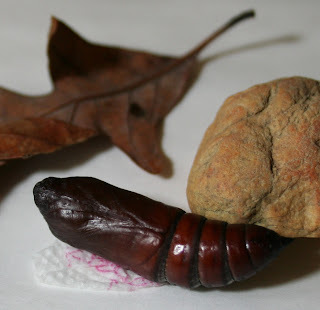 This image however should not be viewed by the "squeamish." 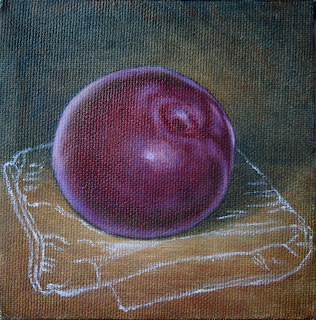 This small original painting is on 4"x4" stretched canvas and is available for purchase. 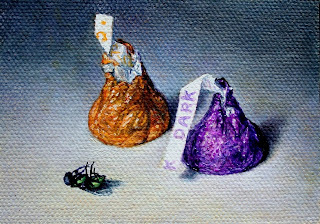 I truly enjoyed painting this little gem! Photo & painting copyright protected. Breaking out the tiny brushes for detail now! After the potholders I paint cat hairs. Then back to the rest of the painting. detail... detail... I don't mind that the vintage potholders are faded..... just adds character right? And now one of the kittens (now all grown up) resides with a family member and is indeed a "real character." Sixth Session: I apply a very thin layer of linseed oil to the bowl then with a tiny amount of titantium on my filbert I lightly drag the brush over the entire bowl... then again in the reflective areas. I will let it dry and move to the kittens. 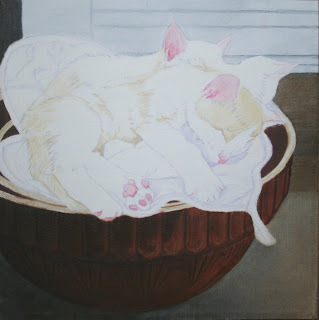 Tomorrow will continue on the bowl with alternating color glazes until it speaks... "I'm pottery" ;0) I also begin underpainting the potholders. 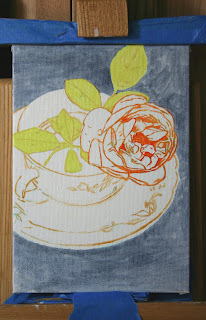 Fifth Session: Have deepened colors by turpentine / burnt umber washes. Now detail work begins. 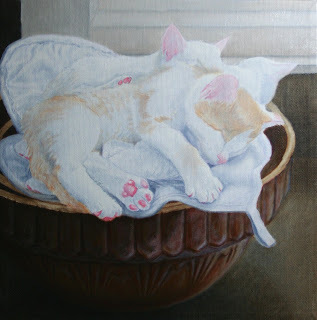 Fourth painting session: Establishing background & lighting / bowl shadows not yet defined as still building up color / tinting kittens ears etc. with rose madder. Now the whites need to dry more before I can continue on the kits. & potholders so will set it aside and continue other works. Update: Third painting session I tinted the background with wash of ultramarine / lamp black. Then applied titanium white to the kittens / potholders. 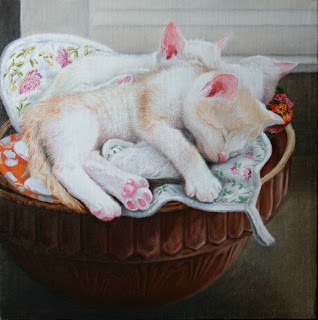 Next I began to establish the calico pattern on the kittens even though the white is still wet. 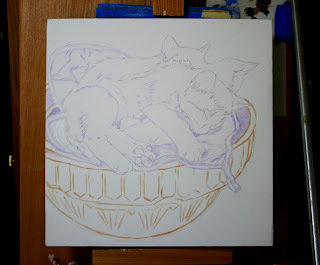 I am still building up the color / contours of the bowl along with adding shadows inside with asphaltum by Gamblin. The top rim I painted with unbleached titanium which was a perfect match to the bowl's color. 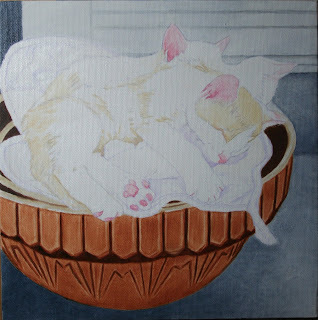 Second Painting Session: Still using a turpentine wash of Burnt Sienna I block in the bowl so as to gradually build up color. I'll let it dry for now and begin painting the potholders with white in preparation for glazing. I will post that progress tomorrow. Third session: A surprise is added to the composition as you can see. 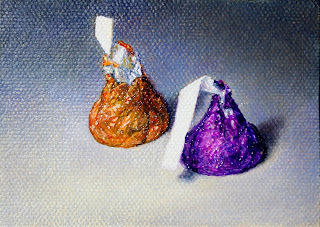 Update second session: Background begun & while drying..... on to the kisses for detail. 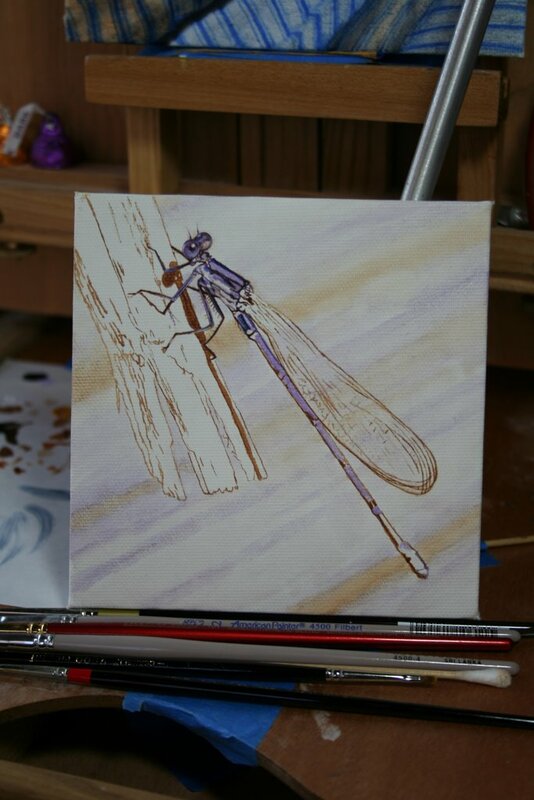 First painting session: on this little ACEO artist trading card. 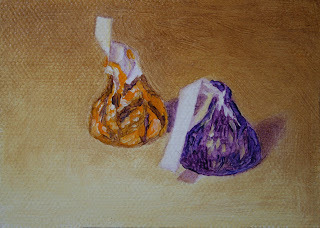 Hard to paint candy when all you really want is to eat it. Good things come to those who wait. I'll set it aside to work on others and post the completed here. Probably two more sessions until done with the last being for detail. Now go right ahead.... have some Chocolate! I have done a quick color blocking on the handkerchief and now detail can begin. I have decided to add my Dad's vintage cotton handkerchief to the composition and used a detail brush to sketch it in with titantium white. Dad loved plums and was never without a handkerchief in his pocket. 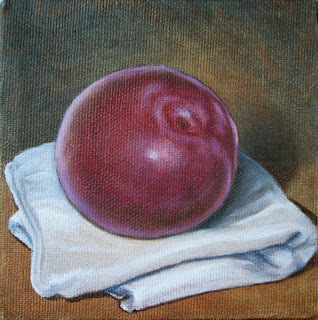 Now I begin on the background deciding upon on a dramatic effect using deep shadows to show off this subject. Update: Have to buy a replacement plum before I can complete.... gone but not forgotten! I am excited about painting this work in progress as the largest of the nesting mixing bowls and the potholders are much used (and loved) heirlooms. The kittens were rescued by a friend and are now adults. They found wonderful loving homes as well. I mapped out the kittens / potholders in washes of ultramarine violet and the bowls in burnt sienna. I prefer ultra. violet as the cats are predominantly white with pale red / brown. Painting Daily Oil Sketch No.2 Damselfly Photo Realism Update: another layer of background color applied & detail begins! Not for sale. I am mapping in the background and trust me..... it will look a lot better soon! 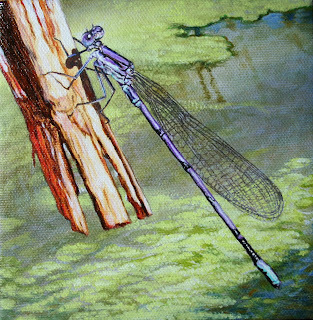 You'll notice that I have covered some of the detail in the damselfly but after taking this photo I was back to work.... cleaning it up before setting it aside for another day ;0) Normally I would have planned the background prior to beginning the painting but since the original photo was taken on a back porch deck..... well after starting it already I decided a trip to the local pond was needed! Algae and beautiful reflections might look more interesting. 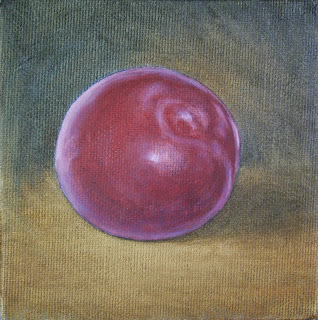 One great thing about painting in oils is that you can paint right over top in the event you change your mind. Next time you see this painting it will be completed and appear very different than it does right now. I'll be back! 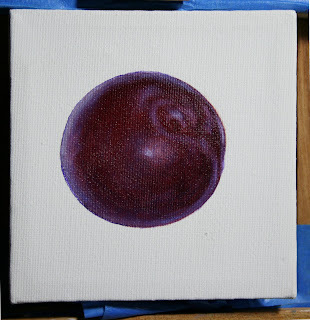 The colors I have used thus far are as follows: Burnt Sienna, Payne's Gray, Ultramarine Violet, and Titanium White. I use filbert brushes for the most part since the painting is small (for linear detail) and also to achieve photo realism. Brush strokes are smoothed so they won't show. 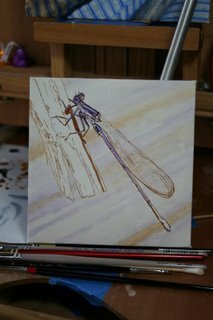 After the drawing of Sienna/turp wash was dry I applied a second layer of paint on the background... even actually covering the damselfly body. While wet I immediately used a small filbert dipped in turpentine (wiped almost dry with a kimwipe) to clean up my initial drawing except for the wings. 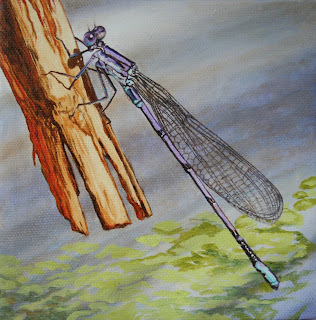 Since the background paint was not applied thickly over the wings drawing it still shows through for future reference. 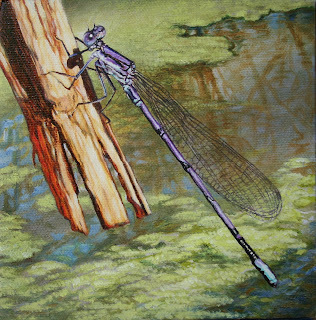 While this new layer of background is drying I will now move on to the stick and then to the damselfly for detail work. 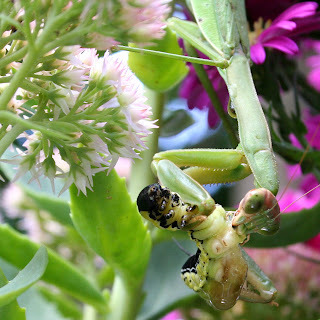 Oh those wings.... so intricate! 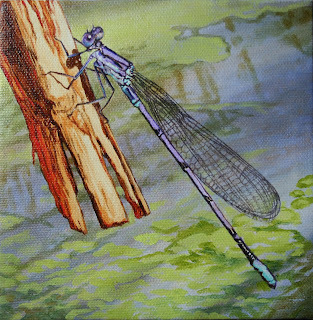 Tomorrow if the background is dry I will apply transparent glazes to it to achieve proper color and tone; complete the detail in the stick and insect, then allow all to dry for application of highlights. If all goes well it should be on eBay in a few days. Some advice: Kimwipes are awesome for wiping and cleaning small brushes.... dust free! 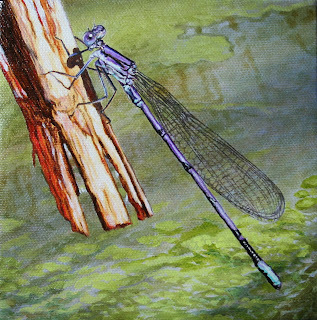 The Damselfly is closely related to the Dragonfly. 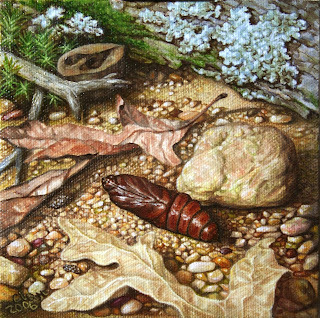 Detailed commentary about this painting's progression can be found in my Nature Art blog: http://carolynhietalanatureartpaintings.blogspot.com/ It was painted last year and I thought it might be nice to have the step-by-step included in this blog..... so here it is. 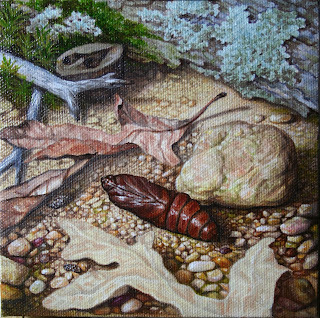 This work was painted from real life subjects (right down to the smallest gravel and moss) that I gathered from my property..... each rested on my easel as I painted. 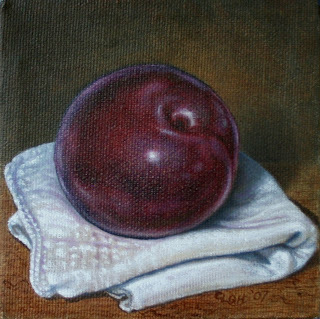 Now go and compose your own "little gem" oil painting ;0) Enjoy!